The World of Aihrde, (Codex of Aihrde/map) is your storyboard. 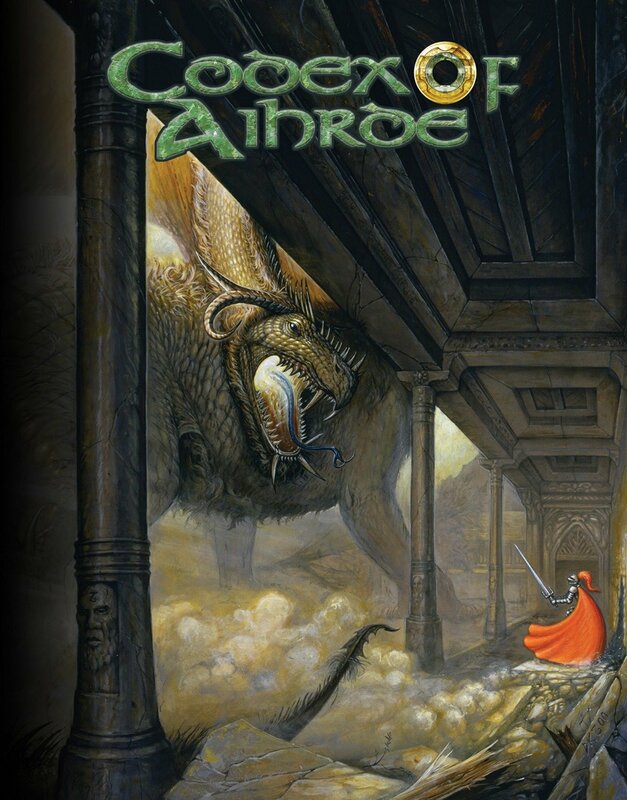 Its vibrant mythology, and an unfolding history, makes the World of Aihrde an unparalleled fantasy setting. With a wealth of playable material, Aihrde is like a tapestry unfolding, one that you can make your own! Rich in adventure hooks, Aihrde is like no other on the market today. It infuses character generation with an energy unique for its genre, and arms the game master with material that is both fixed and malleable. The world of Aihrde spins upon an earth-like axis of ancient civilizations where good and evil have struggled for countless years. It is a world that bears the markings of its past; where ancient evils slumber, stained with the power of eldritch wizardry; where gods dwell in bejeweled halls of wonderment, worshiped by men and women of all creeds; where dragons live in great dens of heaped treasure; where the new stands upon the ruins of the old in beds of ancient glory. The Codex of Aihrde includes everything you need to get started adventuring in one of the most expansive game settings you'll ever enjoy. Part 1 The Andanuth (roughly 102 pages): Here we learn the story of Aihrde, from its uttermost beginning to the present age. It follows the journey of All Father, the creation of the gods and the world. We learn who the gods are and how they interact long before the coming of the dwarves and man. The story covers the creation of these people and more and all their long journeys and travails from their arrival to the realms of the day. The Andanuth is generously sprinkled with stories and tales of gods and men, dwarves and goblins, war and peace. You'll not wonder what happened before...you'll know. Part 2 The Almanac (roughly 170 pages): In part 2 we dive into the particulars of the gods, the people, countries, places and realms of Aihrde. There are over 50 gods outlined for play, a dozen peoples including all your favorites (dwarves, elves, men, halflings, gnomes, orcs, goblins, giants, trolls, dragons and more). Each of 30 plus realms are intimately detailed with history, government, economy, military, present rulers and other specific information. Beyond that we have terrain that is detailed as well. Appendices: Several Appendices cover extra material such as detailed time line, calendar, weather patterns, languages, and flora of Aihrde. All this in one book! Unique Approach: The Codex of Aihrde begins in the year 1197, 80+ years after the fall of the Horned God Unklar, who ruled in Aihrde for a thousand years. What this does for you, the player and game master, is presents you with a world both old....thousands of years of history to build upon...but at the same time very young. For the new Kingdoms are only a few decades old. They are fresh and ripe for expansion. Its more than enough to get you started, but leaves you plenty of room to develop.